Have any of your teeth broken as a result of an injury or accident, or have they gone yellow and discoloured? If so, then a Veneer can help improve their appearance and give you the confidence to smile. Barhill Dental Clinic offers a Veneer’s service to make your teeth appear more natural and healthy. Veneers are a thin layer of porcelain roughly 0.5 -1.0mm in thickness, which are bonded onto the front surface of your teeth in a similar way to how a false fingernail covers your nail. It is attached with a special cement that requires very little preparation. They only require the minimal amount of preparation to the tooth structure and therefore, are a much more conservative restoration than a crown. They are ideal for closing gaps or disguising discoloured teeth that do not respond well to whitening procedures. They also provide long-lasting results and perfect your smile. Having a Veneer requires little or no anaesthetics and is ideal for improving the appearance of the front teeth. They are also ideal for improving or repairing gaps in teeth, crooked teeth or worn or chipped teeth. 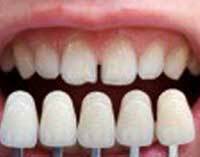 Veneers will last for years, as long as they are well looked after. They can help close up spaces between your teeth or correct rotated teeth. They will help give you a sparkling smile. It will help increase your confidence again about yourself. What is the procedure in having Veneers? The first stage will involve having a consultation with your dentist who will explain exactly what is necessary to correct your dental problems. As the Veneer is very thin and so that it looks natural, your original teeth are shaved back to remove some of the shiny enamel and to rough up the surface to enhance bonding. This will also create space for the thin veneer to cover the teeth so that your teeth will maintain their natural shape. The preparation as well as the actual placement of the veneers is extremely important. At Barhill Dental Clinic, we only use dentists who have many years’ experience in this treatment so you can be rest assured that the end result will be satisfactory. If necessary, a local anaesthetic is used, but this isn’t always required. After the teeth have been prepared, an impression is made of your teeth using dental putty for the Dental Technician. Teeth Shades are also taken so the resulting veneers will match the adjacent teeth perfectly. Once the mould comes back you should have a chance to discuss the colour and shape of your veneer with your dentist. It is important to check your veneers before they are cemented on. Before the veneers are fitted, preparation is carried out to ensure that your teeth are more receptive to the bonding. The dentist will roughen the surface of your tooth enamel using an etching gel made up of a small quantity of phosphoric acid. The rough surface texture means a firmer bond is created with the veneers. The veneers are then fitted with dental cement, which is placed onto the veneer before it is attached to your tooth. To speed up how quickly the cement dries, your dentist will shine a light that permeates the veneer and regulates the cement. This takes only a few minutes and once finished your veneers should be firmly attached. The final step is to trim away any excess cement and to polish the veneers to a shape that you are happy with. You may wish to discuss this with your dentist to agree on the best size and shape for your teeth. Once trimmed and polished you will be left with your desired smile. Overall, after your treatment has been carried out, then stick to a healthy diet and drink a lot of water. This is good for your body and bones. Take a lot of multivitamins and plenty of protein to keep your teeth strong.